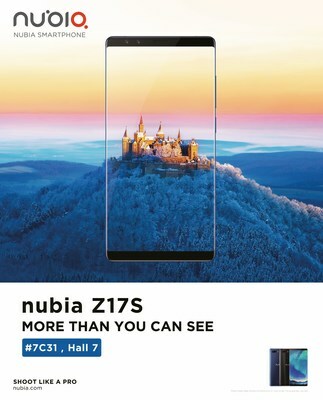 BARCELONA, Spain, Feb. 24, 2018 /PRNewswire/ — nubia, the innovative smartphone brand which boldly defined ‘bezel-less’ with its 90.36% full-screen ratio, edgeless Z17S, is ready to wow the smartphone industry all over again at the 2018 Mobile World Congress, with 3 new products that are sure to bolster the Chinese tech giants’ reputation for outstanding smartphone design. Firstly, nubia is excited to reveal a technological breakthrough at their innovation lab. With a diamond-cut, light-infused, nano-carbon graphite design, this top-secret project is ready to go public. Secondly, the brand new Z17miniS will make its much-awaited debut. It packs top-notch specs, including front & back dual-lens cameras + AI-powered NeoVision7.0, new camera features such as AI Portrait 2.0, light-painting, macro-camera and clone-camera. Its design features four-sided curved glass with glare glass magical optical reaction. It’s a mini marvel, not to be missed. Lastly, nubia will showcase a range of new models which solve the full-screen/short battery-life design conundrum. The new full-screen, long battery-life N/V Series have arrived, which come equipped with Qualcomm processors and a whole lot of RAM, so mobile gamers better get their fingers ready. More surprises await at MWC, where nubia will feature deluxe smartphone accessories and loT products & solutions. There’s sure to be rumblings of when nubia’s own 5G prototypes will make their appearances in 2018, as official nubia 5G models are set to launch in 2019. Last year, nubia expanded its presence in the US, India, Germany, Spain, Indonesia and Thailand while embarking on fruitful partnerships with Amazon, Mediamax and Phone House. nubia also had a string of successful product releases including the Z, M and N Series – all of which means nubia’s booth at MWC ’18 is not to be missed. Founded in 2012, nubia brings premium, innovative smartphones to users looking to get an edge with their mobile device. Inspiring the world to “Be Yourself,” nubia continues to elevate lifestyles with better handheld tech. Headquartered in China, nubia has operations globally, including North America, Europe, and Southeast-Asia. The brand is well known for its innovative smartphone features and professional mobile photography functions. More nubia info can be found on the official website: www.nubia.com/en. Follow @nubiasmartphone on Twitter, @nubiasmartphone on Instagram or www.facebook.com/ nubiasmartphone for the latest news.